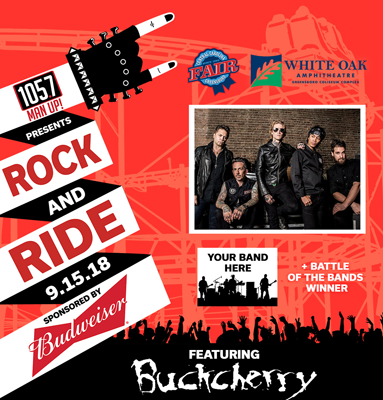 As part of the 2018 Central Carolina Fair Concert Series, 105.7 Man Up presents ‘Rock & Ride’ featuring Buckcherry in concert at White Oak Amphitheatre on Saturday, September 15. A limited number of reserved tickets will go on sale Friday, August 10 at 11 a.m. at www.ticketmaster.com and the Greensboro Coliseum box office. Reserved tickets are $20 and include admission to the Central Carolina Fair. where you could be opening for Buckcherry! Submit your audition video now at 1057ManUp.com/ride. You have until August 26th to send your best stuff. For nearly two decades, Los Angeles’ notorious, multi-platinum-selling rock band Buckcherry has thrived thanks to its arsenal of rock anthems that teem with riotous energy. The Grammy Award-nominated outfit is responsible for smashes including “Lit Up” off their gold-certified 1999 self-titled debut as well as and “Sorry” from 2006’s platinum 15. Along the way, they’ve shared stages with everybody from AC/DC and Mötley Crüe to Slipknot and Rob Zombie, among others. The 120TH annual Central Carolina Fair will be held at the Greensboro Coliseum Complex beginning Friday, September 7 through Sunday, September 16. The Fair will feature spectacular rides, carnival food and games, musical entertainment and attractions for all ages.